Orchid painting, how to paint them! 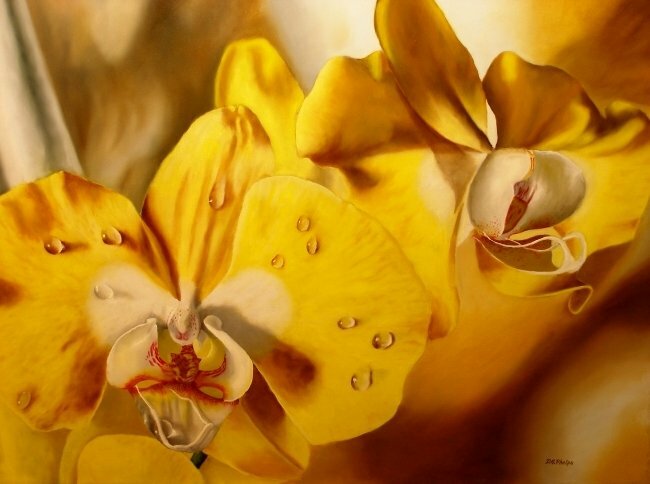 Orchid Painting, how to accomplish a delicate painting from a delicate flower. In this demonstration, orchid painting is the task, I'll show you my typical process, and a little something different when it comes to toning the canvas. 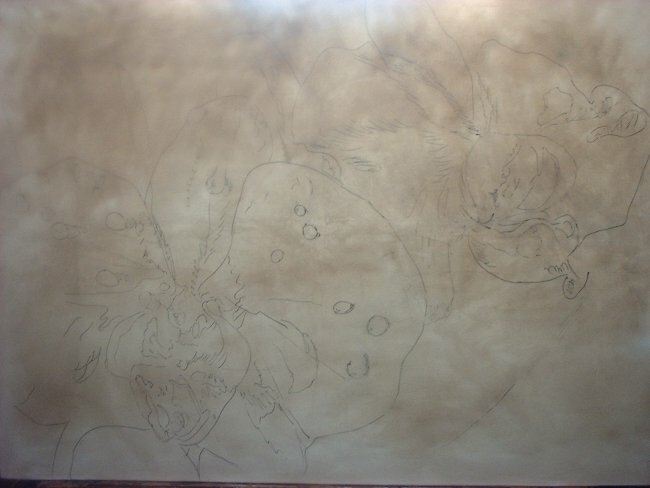 This is a 30" x 40" canvas that has been primed 3 times to get it ultra smooth with acrylic gesso and modeling paste. 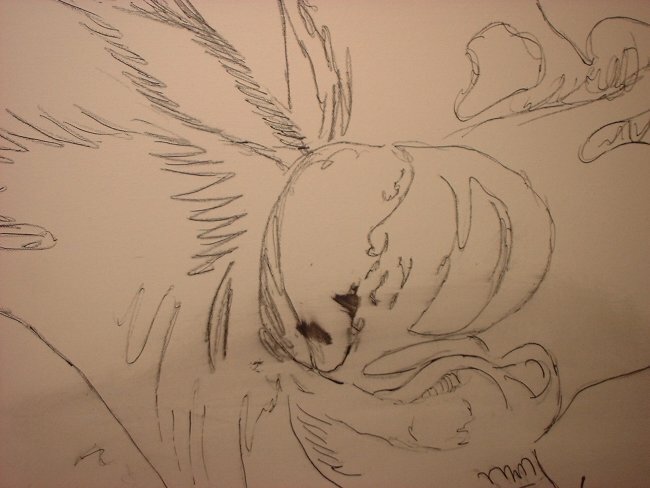 My first photo's here show you a close up of the pencil and ink overlay drawing that starts our painting off. Because I work large, and my final details in painting will usually be covered by the time all the under layers are applied, my sketches are usually really loose. They are used as guidelines. We then apply the oiling out mixture with my hand to help distribute the oils throughout the canvas. You can see the sheen of the oils in this picture. 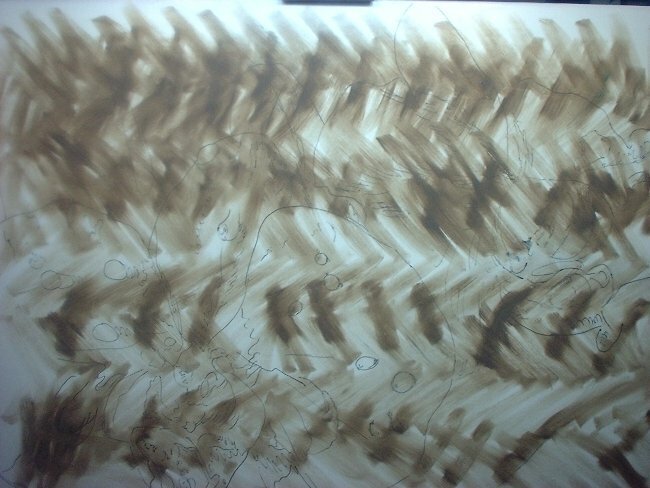 This destroys the pencil drawing, thus, the reason for the ink drawing. You can see the smeared graphite on the canvas in this picture too. 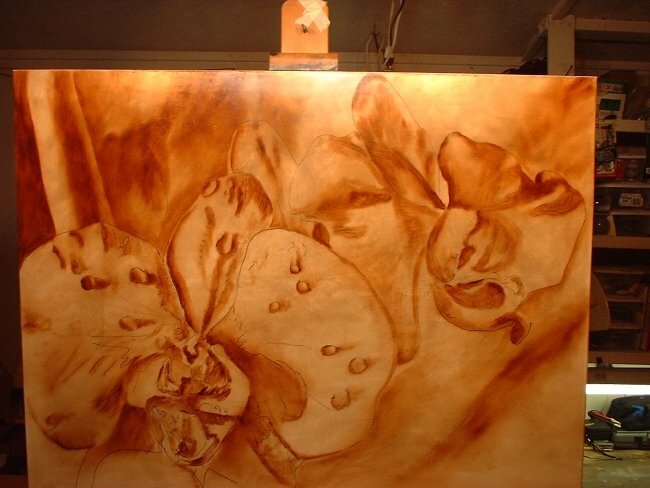 Orchid Painting, toning the canvas without a large brush. Now here's a good way to tone your canvas. Especially if you don't have a large brush. This is the pattern I use to lay in my color, it appears darker than the final tone, but as you spread the paint out it become lighter and shows the under ink drawing just nicely. After laying in the color, I begin to blend it out with a one inch house paint brush. It has what they call and exploded tip that also helps in leaving minimal brush stroke marks. I'm shooting for a uniform coating of paint. The completed canvas toning (above) shows a very uniformly toned canvas that is just a slight shade lighter in value than the middle tone of my final painting. We set the painting away for at least a week to dry. We now begin the brown under painting (below). Remember, this is like applying a watercolor. very thin. you can use a rag to wipe away paint if it is too dark. I discuss this in better detail in the eBook, both in the mixture used, and the technique of applying paint and manipulating the paint to make it look like a finished "Sepia watercolor painting". So, after searching my hard drive, the gray under painting could not be found. Bummer. No worries, as there are multiple examples of that on the site with other paintings, but I was able to show you a slightly different way to tone your canvas with this example. For that I am happy.